2010 March — Open Source Strategies, Inc.
I’m seeing a steady stream of jobs and projects for opentaps from many different sources. I will try to re-tweet them as I see them, so if you are an opentaps service provider, please subscribe to us on twitter at http://twitter.com/opentaps. 1.4 is a big number. The recent opentaps Open Source ERP + CRM Version 1.4 release marks a milestone of our effort to build free, openly available enterprise software. This journey began over six years ago with the goal of building full featured business software that could work for a variety of companies in many different industries. And now, I’m pleased to say, we’ve done it. Take a look at what opentaps can do for you today, and I think you’ll agree that, broadly speaking, we have a very extensive feature set. Take a look at the community around opentaps, and you’ll see that we’ve been validated by companies large and small around the world. Easier — I want opentaps to be easier to use, easier to set up and configure, and easier to customize and build on top of. More advanced — I believe that opentaps is already the most advanced open source ERP and CRM solution available today, thanks to the great open source projects we stand on top of: Apache, Spring, Hibernate, Jasper, Pentaho, Funambol, and Google Web Toolkit. But there are some new technologies now which I believe will fundamentally change the way business software works. I want us to be ahead of the curve, so that your business can be ahead of the curve with opentaps. More community effort – We got here not because of how good we are, but because we’ve been able to leverage the work of many open source projects and their communities. 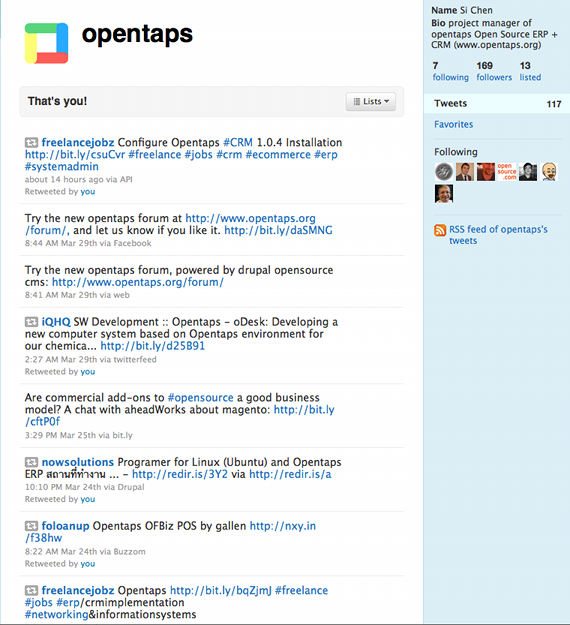 Now that opentaps is gaining momentum of its own, I’d like to see us in turn contribute to other open source projects and their communities–either with more projects based on opentaps, or more modules available for opentaps, like you see with WordPress, Drupal, or Magento. In the next few months, we will be laying the foundation for realizing these goals, and I will let you know as the steps fall into place. Should You Customize Open Source ERP? One of the issues that I have routinely seen over my years as a software consultant concerns customizations. On many a project, the functionality of a COTS application did not meet one of my clients current business practices. Invariably, this would beg the question, “Should we customize the system?” In this post, I’ll look at this from the angle of open source applications. Henley notes an interesting paradox of customizations. Specifically one trap that almost every organization falls into is that of customizing under the false pretense of core competency when in fact what they are doing is customizing to make their ERP to look and work just like the system it is replacing. The second edition of my first book, Why New Systems Fail, takes a deeper look at open source applications, as they continue to make inroads against traditional on-premise applications from the SAPs and Oracles of the world. Organizations considering customizations should look carefully at their available options, ideally with the help of experienced business and technical consultants. It is imperative that they carefully consider the short- and long-term implications of these customizations, lest they be stuck with an unsustainable status quo and paint themselves into a corner. Against this backdrop, I can’t help but wonder: Are customization decisions fundamentally different for clients with COTS apps versus those with OS ones? Who Will Support Your Customizations? Let’s be honest here. The vast majority of “standard” support agreements between clients and on-premise software vendors do not cover customizations. For example, if you want to change the way that the program calculates employee taxes or runs a P&L, you can certainly do so. However, if you read the fine print of your support agreement, you would have violated its terms. You can call support for help, but expect to be billed for assistance. One of the main advantages of open source is that it allows you to customize the software more easily. That’s a major value proposition of OS: they understand that businesses have different needs and don’t have such rigid rules about customizations. Don’st expect unlimited bites at the apple, however. Open does not mean free; if you need support for your customizations, read the support agreements carefully to determine what will and will not be covered. OS projects could be supported by the original developer, like OpenTaps or SugarCRM, which is equivalent to a vendor. Will your vendor support your customizations without incorporating it back into their core product? Not always. Alternatively, they could be supported as part of the open source project by the community, but in that case, your customizations would have to be open sourced as well. Finally, since the source code is openly available, a third party could potentially support your customizations, but the process of getting another group to work with your source code might not be so easy. One of my favorite IT books of the last year is Roger Sessions’ Simple Architectures for Complex Enterprises. Sessions writes about Kevin Drinkwater, CIO at Mainfreight. Drinkwater is “widely recognized for his innovative approach to IT and for the cost effectiveness and agility of his solutions.” In a nutshell, Kevin understands the need for simplicity and, to this end, has a long history of minimizing or removing complexity from many environments. While aiming for simplicity doesn’t guarantee “success”, it sure decreases the chances of failure. In other words, regardless of whether your organization goes with COTS or OS, aim for simplicity. It’s just simpler for everyone involved. Here’s a—and perhaps the—major advantage of OS apps. You control the application. You are not beholden to a vendor’s forced upgrades. Many first-time clients of major vendors foolishly expect that the customizations will work after an application patch or upgrade of versions. Don’t. Again, you are not compelled to upgrade with open source. There are too many different types of customizations, COTS apps, OS alternatives, and programming languages for me to make some type of sweeping generalization here. Just make sure that you do your homework. Don’t assume that an OS customization is easier because it’s OS. Spend some time to understand how easily your application can be customized, and how maintainable those customizations are over time. Note the two are not necessarily the same thing–some applications make customizations easy to make but very hard to maintain. We’ve all been here. Some VP or Director is accustomed to seeing a report in a certain way and, like a bulldog, won’t let go until s/he wins. Changing the sorting on a report or the name of “front end” field is fundamentally different than changing batch programs behind the scenes that affect thousands of transactions each cycle. There’s no one right answer about whether an organization should customize its app (OS or not). Just think about the factors discussed in this article before going down this road. Make sure that your organization budgets the time and financial and human resources to effectively handle the customization. Finally, test whatever changes you have made before going into production. Most OS projects are modular in nature: it’s required for the parallel development style of an OS project. In that sense, technically the average OS project should support add-on modules and customizations more easily than proprietary apps. Of course, each project’s technical structure is different. First check everything carefully. I’ve known about the Magento e-commerce platform since 2008, and I was immediately impressed by its user friendliness and out-of-the-box features. Since then, Magento has really grown, and quite a few members of our community have asked for an integration with this e-commerce system. So, I’m really happy to say that with the help of IntegratingWeb, we have officially released an integration for opentaps Open Source ERP + CRM with the Magento e-commerce platform. Now you will have a choice of either using the Apache OFBiz e-commerce store included in opentaps already or the Magento e-commerce store with opentaps. What’s really cool about this integration is that it adds a web-based Data Access Layer module based on the Pentaho Data Integration (kettle) ETL system. This module is used for importing and transforming data into the opentaps Data Import modules, and you can use it for more than just importing data from Magento. You can use it to import product and order data from other e-commerce or Point Of Sales systems as well, and kettle allows you to graphically redesigned the transformations of your data. Here’s additional information on how to set up the opentaps – Magento integration. Enjoy!